Automatic Data Processing, Inc. with nearly $9 billion in revenues and over 585,000 clients, is one of the world's largest providers of business outsourcing solutions. Leveraging nearly 60 years of experience, ADP offers the widest range of HR, payroll, tax and benefits administration solutions from a single source. ADP's easy-to-use solutions for employers provide superior value to organizations of all types and sizes. Annual Red Hot Holiday Mixer! Red Hot Holiday Mixer-Silicon Valley! Join WITI on Facebook! Millions of people use Facebook everyday to keep up with friends and colleagues. Visit Facebook.com and select the "Request to Join Group" link to show your support, get updates, special offers and more... Details! WITI, the world's leading professional organization for tech-savvy women, is proud to announce Global Partnership Agreements with several major corporations, including AT&T, Disney, eBay, EMC, IBM and Thomson Reuters. WITI provides its partners "WITI in a Box" - a plug/play platform "Powered by WITI" which provides these companies access to online/offline training, support and recognition for their employees worldwide. WITI Partner employees also gain access to WITI's global network of professional women, a rich variety of training tools, webinars, classes, conferences, and a growing number of WITI Networks worldwide. Do You Know the Best Price for Your Company? Can You Defend Your Value? I think about creating value all the time. I mean ALL the time. It didn't used to be that way. The status quo was that I worked hard toward project goals, got my paycheck every two weeks, had my weekends off to do as I liked, and waited to see what the percentage raise was going to be. Anyone identify with this? It's Time Again to Get Together for the Holidays! Join the Southern California technology and business communities as we gather for Digital Family Reunion '09 at Wokcano Restaurant... Register Now! Many people are approaching the holidays carefully again this year exploring avenues to trim their budgets without sacrificing the joy of the season. I'm always impressed by those who plan for the holidays by saving in advance. Doing that frees you from credit card remorse in January. If you don't already have a budget item in your Mindful Cash Flow worksheet, be sure to include it now so you'll be better prepared next year. WITI's 4th Annual Technology for Tots Event Returns to Las Vegas! Join WITI Las Vegas for the Holidays! Join the leading technology organizations in Las Vegas once again, for an industry-wide semi-formal Holiday Gala to make the holidays a little brighter for underprivileged kids in the Las Vegas valley... Details! Does it ever seem like you are like a passenger in the car that is your life - and someone or something else is in the driver's seat as you careen down the road? Do you feel driven to do things but are not quite sure why? Is your external environment not working for you but you seem powerless to change it? It is easy to get hooked on things and beliefs that simply drag you along. Here are three common oversights that can cause you to become unconsciously aligned and identified with thoughts and things that can run you ragged - and how to unhook from them. 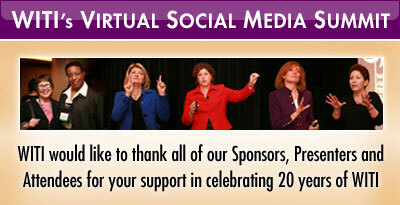 Thank You for Attending WITI's 1st Annual Virtual Summit! Were You Unable to Attend WITI's Virtual Summit? Discounted Post-Summit Registration is Now Available for WITI's 1st Annual Virtual Social Media Summit: Access Exclusive Content from Leading Experts in Social Media Today... Register Now! Did You Miss a Session from WITI's Virtual Summit? Exclusive Content is Available Online for Attendees of WITI's Virtual Social Media Summit... Details! Nearly 50 percent of all U.S. workers feel overwhelmed by a growing number of job tasks and longer working hours. High levels of stress in the workplace often lead to job burnout, resulting in lower productivity. How can you effectively manage this stress and become more effective in today's demanding work environment? Join Kathleen Barton, MBA, for the answers to these and many other concerns. This class and the archived recording is INCLUDED in WITI membership... Details! Join Marjorie Kase for "Designing Facebook Pages for Business". Facebook is great for keeping up with family and former classmates, but did you know it is also a powerful, recession friendly, tool for business? Whether you are an executive or entrepreneur, Facebook fan pages will improve the way you promote your product and increase sales for free. This class is DISCOUNTED for WITI Members and the archived recording is INCLUDED in WITI membership... Click here for details! Marjorie Kase's "Facebook Privacy Clinic" will provide you with step-by-step instructions on how to protect your personal information. By the end of this clinic, you will know how to maintain your professional reputation on Facebook and still enjoy sharing pics of your friends and family without worry. Join Nicole Spicer for the following topics: What happens when you apply to a job via the internet; How the internal systems and processes work - Behind the Scenes of Recruitment; Learn about the bottlenecks and how they affect your search process; Et al. This class is DISCOUNTED for WITI Members and the archived recording is INCLUDED in WITI membership... Details! Start the New Year on the right financial foot with Judi Martindale. This webinar will provide an overview of the Top Ten Tips for a Happy (and Secure) Financial Life. Topics include: Earn more (!) and spend less; Invest w/an eye on fees; The diversified portfolio; Et al. WITI Members: Click Here to Download Exclusive Audio and Powerpoint Resources from Previous WITI Teleclasses & Webinars! Not a WITI Member? Click Here for a Complete List of Member Opportunities! Huge savings on phones and accessories at the WITI Wireless Center! This month's specials include free BlackBerrys and waived activation fee on AT&T plans. WITI Strategist Subscribers Protect Your Identity with LifeLock! Protect your Identity and Save 10% Off LifeLock! A new survey shows women are 26% more likely to become victims of identity theft than men. * But there are steps you can take to reduce your risk. WITI has partnered with LifeLock to give WITI members a special offer plus a 10% discount on LifeLock membership. Just visit www.lifelock.com or call 1-800-LIFELOCK (543-3562) and use promotion code 'WIT2' to save and help protect your identity today. * Source: Javelin Strategy & Research. "2009 Identity Fraud Survey Report." February 2009. 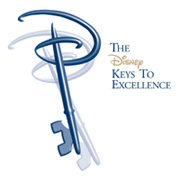 Join WITI @ Disney Keys to Excellence! It doesn't take any training to recognize that the world's economy has taken a significant downturn. It does take effective and proven professional development training to guide impacted organizations back to the summit. A one-day local workshop, the Disney Keys to Excellence program is a rare and affordable opportunity to learn best business practices from Disney insiders. Organizations from across the nation have learned proven philosophies and implemented effective processes to reap the rewards of improvements in leadership, management, service, and brand loyalty. IMPORTANT: Please use promotional code WITIMNE to receive $50 OFF PER GUEST when registering.